The revision control in document refer to when any changes made in the document, then the version number of the document updated. It is used to keep track all the changes made in the document. Sometime it also require the signature of the person that has updated the particular document. Revision control is very useful in the multi-user Environment. Revision control is the management of changes or updates made over time by different users in a document. Revision control is very important feature because in case if somebody make misuse of your document then it can be track very easily. It also ensures that only the current version of a the document is viewable to a user and only specific users have the access to the previous versions. How Revision control is handled manually in document ? Every Organization produce a huge amount of data everyday which gets documented further. So, Traditionally all the documents in paper form are maintained manually in a shelf or cupboard. If somebody is willing to make some changes in a particular document then that person has to visit the respective section of shelf and take the particular document from it and make the necessary changes in the document. After updating the document, user change the version number and attach the signature for the security purpose and at last will keep that document back in the shelf or cupboard. EDMS is the acronym for Electronic Document Management System. It is the process of storing, managing and accessing large amount of documents electronically with the use of computer system or any other electronic device. To manage document electronically we need to upload the documents into the system and the user who upload the document will be the owner of that document. If an owner want to edit a file then it must be checked out first. Checked out means bringing back the uploaded document from the system. If the document is in check out status no other user can checked out that document. After checked out, Owner can make the desired changes in it. After updating the document that user has to check in that document back into the system. Once the user has checked in the document, the system update the version number of the document. Here we introduce DocControl, A powerful Document Control System basically for both small and medium sized businesses. It manages and controls documents electronically. One of the awesome feature of DocControl is its Automatic Revision Control in which the version number automatically changes when the specific document is updated. DocControl provided two modes of maintaining the revision number either by ‘Major’ which increase the revision number to the next whole integer, or ‘Minor’ which increase the revision number by a decimal point. 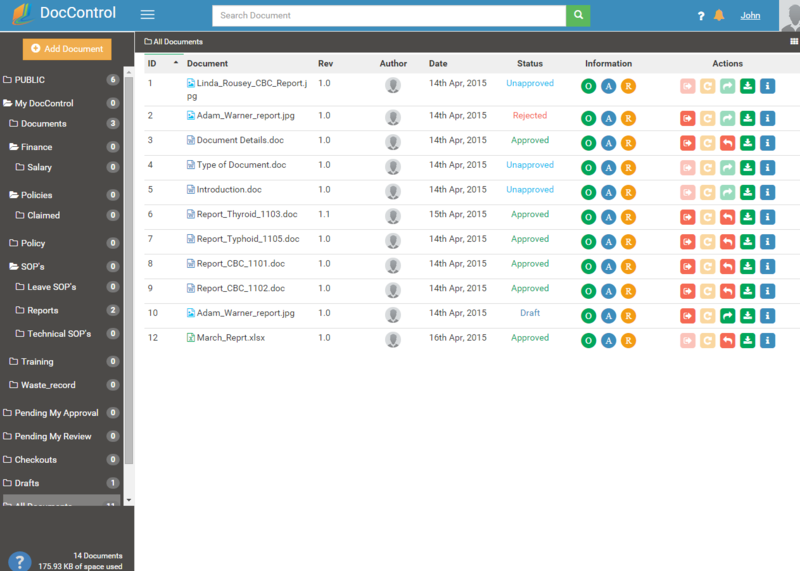 Every good document management system must have an awesome Revision Control feature which help user to access previous as well as updated document at any point of time.